We recently visited Hiroshima as part of our 10th Anniversary celebratory trip to Japan’s Inland Sea area. It’s a place that neither of us had visited before, but one we both wanted to see. I wasn’t really sure what to expect, but I felt very sure it was something that I should see; maybe it’s something that everyone should see. Any discussion of the war in Japan is pretty much taboo – extremely dangerous territory that arouses strong passions on both sides. Even seventy years later, so many aspects of the debate remain unresolved and questions unanswered. But for me, Hiroshima and what happened there is not so much about the rights and wrongs of the war, but about the terrible price paid by ordinary people for the decisions made by others; people whose only “crime” was to have been born in that place at that time. They could have been anyone; they could have been you or I. Their story, then, is our story. The name Hiroshima invokes mental images of death, fire and carnage. But in reality the city was, and is, a beautiful place with an almost European feel to it. Trams ply the streets and the rivers are lined by tranquil parks and little cafes. The only thing out of place in this neat, clean environment is the remains of the City Hall which stand as a stark reminder of the carnage unleashed on that August morning. 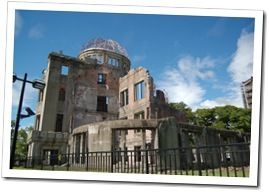 The Genbaku Dome (genbaku means atomic fission) is instantly recognisable. The atomic weapon exploded 600m directly above the dome, and because the force of the blast was directed directly downwards rather than laterally, the building remained standing – one of only a handful to remain so. Even today, some Western commentators criticise the Japanese for portraying themselves as the victims of war. But seeing the reality of what happened in Hiroshima, it is difficult to think of the Japanese civilian population as anything other than victims; ordinary people who paid a price every bit as horrible as those in Dresden, Coventry or Nanking. Some in the West even go so far to say the Japanese deserved Hiroshima and Nagasaki in atonement for its aggression in Asia. Even the English captions in the museum seem to pander towards this line of thinking, using phrases like “…Japan started the war in the Pacific”. The Japanese captions, however, use very different language. And therein lies the source of the heat that still burns seventy years later. This is a massive subject, and maybe one for another time. But it’s just worth noting a couple of points. Firstly, the West has largely written-out of history the reasons why Japan felt compelled to go to war. The story actually began a long time before that, in July 1853 with the arrival in Tokyo Bay of the US Navy under Admiral Perry and his fleet of warships, that turned their guns on the city and threatened to destroy it unless Japan opened its borders to the West. What followed was a period of dramatic and violent political upheaval in Japan, and a series of somewhat one-sided treaties that the Japanese were forced at gunpoint to sign. That set in motion a chain of events that culminated in 1941 with the US blockade of oil shipments to Japan which was the immediate precursor to Japan’s attack on Pearl Harbour. The second point is that until the US occupation in 1945, Japan was still effectively a feudal economy under military rule, just as it had been under the Tokugawa shogunate. There was no democracy in Japan. Unlike Nazi Germany, where the rise of fascism at least had its roots in democratic process, Japanese people had no power whatsoever to effect change, nor to avoid the consequences of the policies followed by its military government at the time. They were, then, in a very real sense “victims” of both their own ruling class AND US foreign policy at the time. The Japanese are acutely aware of both their own sense of victimhood, and the fact that these feelings are not understood in the West. 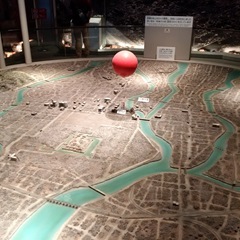 The museum at Hiroshima makes much of the children killed and maimed in the atomic bombing, but almost completely fails to mention the fact that Hiroshima was a garrison city and one of the main embarkation points for the Imperial Army, essential in supporting Japan’s military campaigns in Asia. But for all that, the Japanese today are genuinely passionate and resolute in their commitment to peace. One phrase used on one of the memorials in the city cautions against the “misguided policies of governments”. An admonishment that could apply equally well to Blair and Bush’s criminal war in Iraq as it could Japanese imperial expansion in Asia. Previous Post What’s so great about Japan?